The installation can be found at github. For me, I just have to download exe installer to execute in Windows. The default UI is quite similar with sublime text. Those who comes from sublime text will be pretty happy with it. The initialize time is slower than nodepad++ and sublime text, however its faster than eclipse. It comes with lots of nice packages as default. For example PHP, git source control and etc. It also comes with spell checking, word autocomplete for writing normal blog post. It has increase my productivity when writing small project or blog post. For coding for PHP application in my daily professional job, it is lacking the functionality of code navigation. This is due to when working on a PHP application that is manage by a big team, the code base is really large and code navigation largely increase the productivity. Eclipse do well in this part, it just has to Ctrl + click the class, normally it will navigate to the correct file. For me, its worth to install atom. 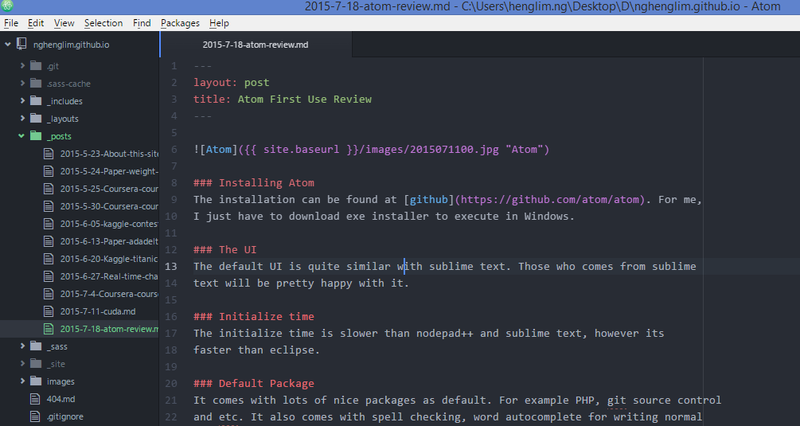 It makes me feel pro to write my blog post in atom than in nodepad++.